For the official rules, please visit the GAA online. Note: Field and team size are often smaller in the US due to the population of 100-yard fields. A game of hurling is played by two teams. Each team is comprised of up to 15 players. 3 Players pair up with their opposite marks. A game or match usually consists of two halves of 25-35 minutes. The sliotar (ball) cannot be picked up from the ground directly with the hand. The hurley must be used to roll, jab, lift or flick the sliotar into the hand. The sliotar can be caught while in the air or bouncing along the ground. The sliotar can be transferred to the hand at most twice. If the sliotar touches the ground, the count is reset. The sliotar can be hit with the hurley on the ground or in the air. The sliotar can also be kicked or hand passed, using one hand for the entire movement. The sliotar cannot be thrown. The sliotar can be kept in the hand for at most 4 consecutive steps or the length of time to take 4 steps. The sliotar can be balanced on the stick for an unlimited time. Touching the sliotar directly with a hand while it is on the ground. Overplaying the sliotar by catching it more than twice with the hand or running for more than four steps while in the hand. Physically challenging a player while the sliotar is not present (off the ball challenge) or by playing in an aggressive and illegal manner. A player may not grab or hold another player’s hurley. Hurling is a physical game and a certain amount of contact is permitted, provided it is in attempting to gain possession of the sliotar. A fair shoulder charge is permitted. A point is scored when the sliotar is hit over the crossbar, which is above the goal keeper, and between the goal posts. A goal is scored when the sliotar is hit under the cross bar and into the goal between the goal posts. A goal is worth 3 points. Goals and points can be scored from play or from ‘set pieces’ such as a free or a side line cut. 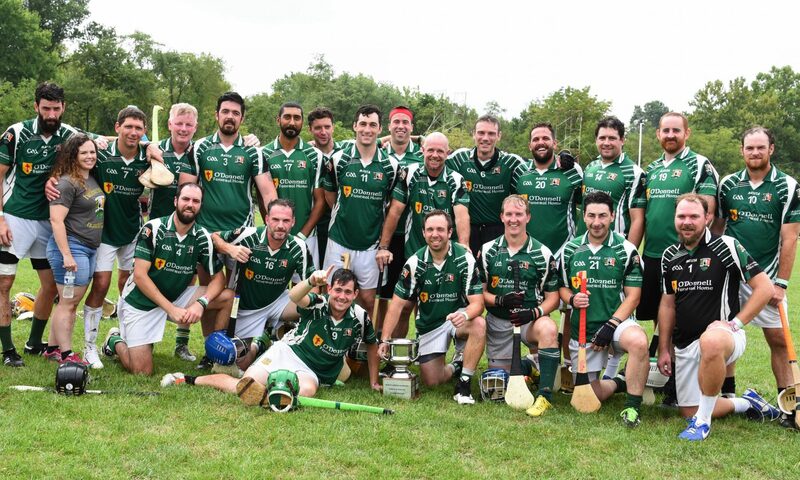 Picking up the sliotar via rolling the sliotar with the hurley into the hand (roll lift) or by using the hurley to scoop the sliotar into the hand (jab lift). Balancing and running with the sliotar on the hurley (solo run). Striking the sliotar with the hurley on the ground (ground pull or hurl) and by tossing the sliotar into the air and striking it. Striking the sliotar while moving on the ground or in the air (doubling on the sliotar). Free Taking: Picking the sliotar from the ground and striking it in one movement without handling the sliotar. Sideline cut: Chipping the sliotar from the ground when it goes over a sideline. Fielding the sliotar by catching it in the air. Blocking a shot is when a player uses his/her hurley to prevent another player from striking the sliotar. This tackle must be done from in front of the striker as they are tossing the sliotar into the air. ‘Hooking’ is a skill where a player uses his/her hurley to prevent another player from striking the sliotar. This is done from behind the striker and his/her hurley must be intercepted as the striking motion is taking place.